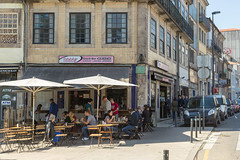 Casa Guedes is really a simple little café right next to Jardim de São Lázaro, with a nice tile-lined interior, a few indoor seats, and a pretty large patio of tightly packed and slightly wobbly tables, and, at most times, at least a modest queue waiting to order. 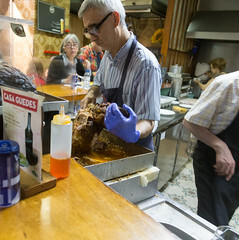 But there’s a really nice routine going on here: in the back of Casa Guedes, they’ve got a giant oven roasting up pork knuckles (a.k.a. “hock”, or what the Germans call Schweinshaxe) which have been basted with some sort of tightly held secret spice mix of Brazilian origin. One by one, the roasts are brought up to a serving tray at the front where a cook (I think he’s the owner, actually) carefully carves the meat off of the bone and assembles sandwiches, dipping both the bread and the carved meat into the juices running off of the roast (much like getting a “wet”-style Chicago Hot Italian Beef sandwich). 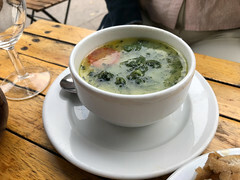 We started with a bowl of caldo verde (our umpteenth in Portugal), and like all the other places, the soup didn’t disappoint; a rich mix of potato, broth, a bit of sausage, and a lot of finely chopped kale, this soup is flavorful, hearty, and even pretty healthy. But the main attraction here is the sandwich. For my first sandwich, I got sande de pernil com porco preto. 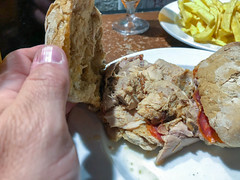 It’s a variation of their standard sand de pernil where they’ve added a thick slice of cured black pork, so the resulting sandwich is a nice stackup of soft bread (infiltrated by the juices from the pork), a nice layer of tender, flavorful pork chunks, and a bit of spice and saltiness from the cured pork. It’s a simple sandwich, but oh, the execution here. The sande pernil com queijo (pork and cheese) takes the same basic idea and takes it up a notch by adding a surprisingly thick slab of Serra da Estrela cheese: a somewhat soft, somewhat stinky white cheese that just oozes into the pork in a rather nice combination of pork and cheese goodliness. The place has it’s fun little quirks, too. Since we enjoyed both the sand de pernil com porco preto and the sande de pernil com queijo , on our second visit we even discovered that there’s some pretty strong rigor to the menu; an attempt to order the sande pernil com queijo e porco preto (combining the cheese and cured pork options) met with surprisingly firm resistance, so if you really want to try this combination I recommend just getting two, since the sandwiches are cheap enough (a few euros each). They’ve also got a decent selection of beer, Sangria, wine (with their own house label! ), and other beverages, so you can retire outside with some sandwiches, fries, and a light beverage and enjoy people watching while you devour your pork. 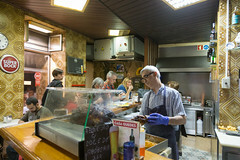 Honestly, if you told me I was passing through Porto and only had time to stop at one place for a quick bite to eat? 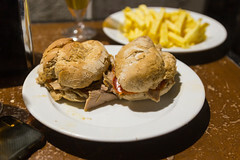 While I love a good Francesinha, if I’m looking for a quick, affordable snapshot of Portugal’s pork in one little sandwich? My choice would be Casa Guedes. It’s just a great little shop.